State employees and legislators protesting the lack of cost-of-living raises in next year’s budget found an unusual supporter Tuesday — Gov. Larry Hogan, who provided no pay raises in his fiscal 2016 budget. “This was the most difficult decision we had in the entire budget process,” Hogan told reporters in a wide-ranging news conference. “We had big arguments with our budget team” on the issue, Hogan said, adding that the only alternatives were thousands of layoffs or furloughs. Hogan also said he agreed with respondents to a new Washington Post poll that showed Marylanders want more money for education. “If the people in the legislature can find more money for education, we’re willing to do that,” Hogan said. He said the same thing about pay hikes for the state workers, whom he praised as hard-working and dedicated. 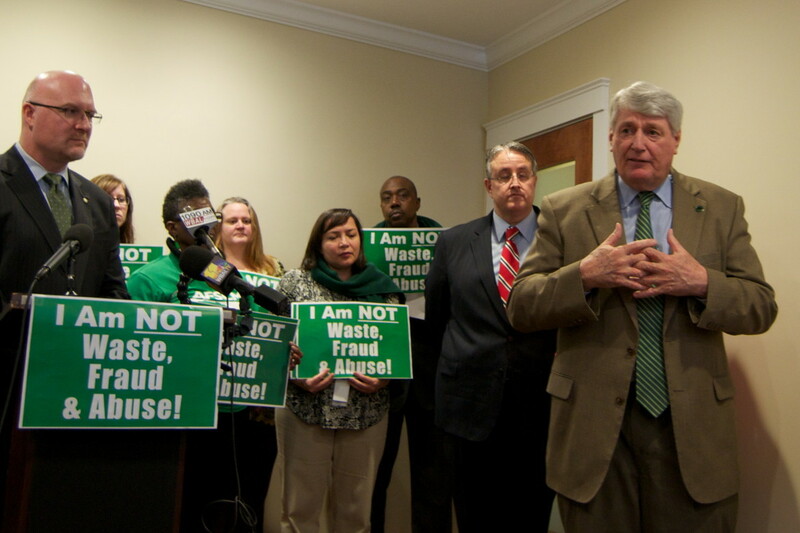 Hours before Hogan’s press conference on his proposed repeal of the rain tax — one of his most popular stands, according to the Post poll — AFSCME, the largest union representing state workers, and legislative leaders spoke out against Hogan’s failure to fund pay hikes. “You cannot constantly balance your budget on the backs of state employees,” said House Speaker Michael Busch. “Over the last 10 years, they have been the meat and bones from which we have carved our budget cuts,” said Sen. Richard Madaleno, vice chair of the Senate Budget Committee. In order to balance next year’s budget, Hogan eliminated both cost-of-living increases and step increases for state workers, saving $162 million. He also is calling for 2% in unspecified cuts to state agency budgets. The heads of the budget committees in the House and Senate have asked for more details about where these cuts might come from. According to legislative analysts, Hogan’s budget does slightly increase school funding by 0.4%, a $6.1 billion item in the budget, leading to his accurate claim of record funding for education. But that is $144 million less than the counties and Baltimore City were expecting for schools. Half the counties will receive 1% to 2% less state aid than they did last year, and Baltimore City gets $41 million less, a 3.3% reduction. This is partially due to increasing property values in the city, which affect the wealth calculation and its ability to collect taxes that is part of the funding formula. The legislature must approve changes in mandated school funding formulas to balance the budget Hogan has proposed.